Well, I may say there were no surprises, but in fact the Greek economy contracted more than many observers expected in the fourth quarter, while downward revisions to the rest of 2009 converted the present recession into the country’s worst since 1987. Evidently the latest numbers offer the first warning that all may not be as simple as it looks on paper for the Greek government’s plan to set their finances straight. As far as I am concerned the latest numbers simply confirm what should already have been abundantly evident – correcting the fiscal deficit without straightening out the rest of the economic distortions is going to make economic growth something which is very hard to come by. According to the Greek National Statistics Office gross domestic product contracted by 0.8 percent in the fourth quarter, significantly more than the 0.5 percent drop forecast in a Reuters survey of economists. The data clearly reveal that Greece’s downturn actually picked up speed from a revised 0.5 percent in the third quarter, casting doubt over government estimates of a return to growth in the second part of this year, and raising yet more issues about the evolution of the debt to GDP ratio. On a year-on-year basis, the economy shrank 2.6 percent in the fourth quarter following a revised fall of 2.5 percent in the third. The sweeping data revision showed Greek GDP contracted by 2 percent in 2009 as a whole, considerably more than the government’s earlier 1.2 percent estimate, making for the worst annual performance in nearly 30 years. The latest batch of data changes only serve to further undermine the government’s already badly dented statistical credibility, even if the Greeks are far from being alone in carrying out this type of revision. But it is the scale of the revisions which is so striking in the Greek case – GDP shrank, for example, by a quarter-on-quarter 1 percent in the first quarter of last year: twice the earlier estimate, and the sharpest quarterly contraction since 2005. In the second quarter, GDP fell 0.3 percent, compared with an earlier estimate of a 0.1 percent, while third-quarter GDP shrank 0.5 percent revised from the earlier estimate of 0.4 percent. Rather than leaving the impression that government GDP figures are “doctored” what the revisions suggest is that the government actually has little real idea of what is going on in the economy at any given moment in time, a conclusion I personally find even more disturbing. The revisions will also push up the figure for Greeceâ€™s budget deficit last year, possibly by 0.1 percent, leaving the current “final, final figure” standing at something like 12.8 percent while the debt to GDP ratio may increase 1.2 percentage points to 114.6 percent. But then the Greek Finance Ministry have just amended the 2009 fiscal cash execution data they provide on their website, and have added close to 6 billion Euro to the December expenditure number, making for a final total of 11.8 billion Euro for the month. This number takes the full-year deficit to 37.9 billionn – up from the 29.4 billion Euro previously reported, with the implication that there will be a further substantial increase in the 2009 central government budget deficit. To date no explanation has been offered for the revision, although a good guess would be it is associated with the payment hospital supply arrears, in which case the general government deficit may well have been proportionately reduced. As I pointed out in this post, even after all the glare of public scrutiny considerable uncertainty still surrounds the 2009 deficit number, and the latest revision is just one more stunning example of the kind of payments changes which one can find made without further explanation. As I say, the biggest doubt here isn’t the sincerity of the numbers, but the ability of the government itself to control what actually happens. While the current pace of GDP contraction may slow somewhat there is little actual hope for a real and sustainable return to growth in the Greek economy in the forseeable future, and especially as the impact of the fiscal correction starts to bite. 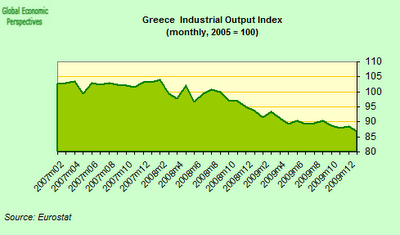 Unsurprisingly Greek industrial output continued its fall in December, and was down 2% from November. And the January PMI suggested that the contraction in industrial output continues and may even be accelerating. 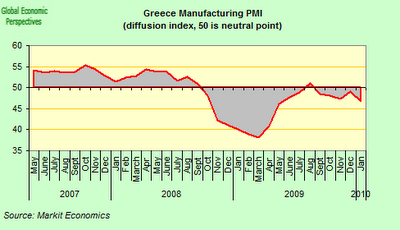 â€œThe onset of the new year brought little hope of a near-term recovery in Greek manufacturing. Accelerating contractions in new orders, output and employment caused the headline PMI to sink to an eight-month low. Meanwhile, firms were struggling to cover rising costs, as strong competition and unfavourable demand conditions rendered them unable to raise charges. 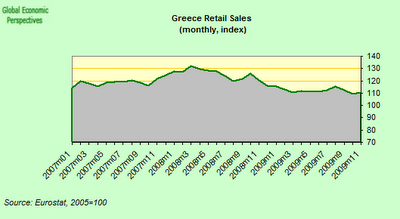 Domestic demand also shows few signs of life, and retail sales are falling steadily. 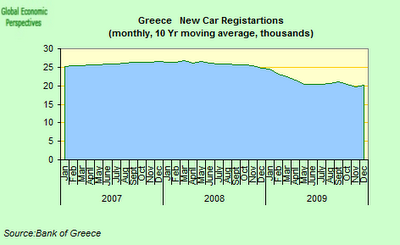 As are new car sales. While Greece has not had the kind of private credit boom that countries like Spain and Ireland have seen (in terms of the levels of indebtedness) credit was increasing at an annual rate of over 20% before the crisis hit, and this boom in borrowing has now clearly run out of steam. 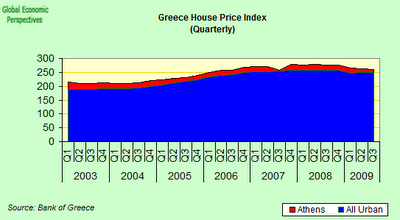 But in fact there was no bubble in house prices in Greece. 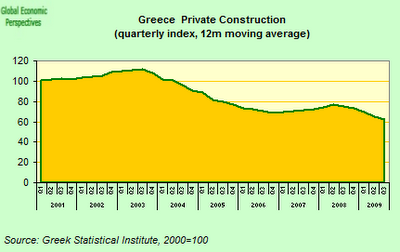 And private construction activity (housebuilding) has been falling since 2003. Nonethless a very substantial current account deficit was created, as the competitiveness of domestic manufacturing industry wilted. This deficit has been reducing, but both goods and services exports have been falling, so there would seem to be little likelihood at this point of a tourism-driven economic expansion. Rumours still abound regarding the possibility of an eventual EU bailout package. The central scenario still remains the same, namely that money will be made available eventually, as and when needed (probably by end of March), even if the precise mechanism to be used is not yet clear. Speculation continues that the IMF may well play some sort of role, although, again, at this point in time it is far from clear what precise form their participation might take. US economist Jeffery Frankey this week added his name to the long list of those who have now come out in favour of a role for the fund (I have long had my name on the venerable list), and makes at least one novel argument: that core Europe, far from expressing their reservations about a hypothetical IMF role, should in fact be only too happy to welcome one. Europeans worry that if Greece were put into default, troubles in Portugal and Spain would appear as quickly as heads on a hydra. Perhaps it is glib for an American, on the other side of the Atlantic, to discount the financial strains that Greece is placing on Europe â€” including Mediterranean contagion, loss of prestige of European institutions, and depreciation of the euro. But in fact it is the northern Europeans who should be most eager for the IMF to come in. They should be the most worried about what they are going to say to Portugal, Spain, Italy and Ireland, if instead they have just bailed out Greece. Meanwhile the IMF itself continues to wait courteously on the sidelines, limiting itself to stating, as IMF First Deputy Managing Director John Lipsky put it this weekend, that the Fund “is willing to support Greece as thought appropriate by the Greek authorities”. And judging by the latest statements by Greek Prime Minister George Papandreou, thinking is something the Greek administration will be doing a lot of in the coming days, especially after the recent demonstration of “tough love” (lots of words but little tangible support) from their European counterparts. Papandreou reportedly criticised the European Union’s response to the country’s financial crisis as “timid and too slow” in a televised cabinet meeting in Athens on Friday. He also asserted that the EU lacked coordination, and had effectively undermined Greece’s credibility. Speaking on his return from Brussels, Mr Papandreou said that while Greece had received a statement of support, delays and conflicting statements over the past few months had actually served to make matters worse. “But in the battle against the impressions and the psychology of the market, it [the EU response] was at the very least timid, ” the BBC report him as saying. 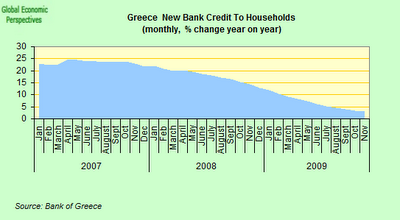 Basically Papandreou’s comments are completely out of place, even if they are intended for domestic consumption. It was always unrealistic for Europe’s political leaders to agree to more than general guidelines for how a rescue plan might take place at last week’s meeting. A firm commitment was virtually impossible, partly because some of the possible solutions – bilateral lending, for example – would very likely have to be approved by the relevant national parliaments, if support was to go anywhere beyond small token sums. Given the complexity of all this, and the amount of fine tuning still to be carried out, it is hardly suprising that nothing substantial was announced, and especially given the fact that the Eurogroup are entering into what effectively consitutes new institutional terrain, while France and Germany, for example, may be very reticent to get too far involved with their Southern neighbours at the cost of loosening ties with – say – the UK and Sweden, which is why Frankel may have a very solid point. Nothing is going to change the fact that if Greece really does tighten fiscal policy by 3 or 4 percentage points of GDP over the next four years, growth is going to be almost non-existent. This is going to be a long hard slog and providing a temporary bridging loan to guarantee Greeceâ€™s solvency this year will not avoid the fact that the same will be needed next year, the year after and the year after that. As is by now very well known Greece has one of the highest government debt levels as percentage of GDP among the OECD countries. The governmentâ€™s gross debt burden is expected to rise sharply to 135% in 2012, based on the latest EU Commission projections – up from 99% in 2008. This rise is driven by ongoing fiscal deficits, which hit a minimum of 12.7% in 2009, as a result of the unexpectedly large size of Greece’s economic downturn. The deficit is expected to continue to be large in 2011 – as a result of the continuing shortfall in tax revenues. On the governmentâ€™s own estimates the budget deficit is expected to remain significantly above the EU budget deficit ceiling of 3% until 2012. Thus the Greek government will have substantial borrowing requirements through 2012, with something like â‚¬45.2billion gross issuance being needed in 2010 (in addition to the recently issued â‚¬8billionn of 5-year GGBâ€™s) and a further â‚¬45 billion or so in 2011. Greeceâ€™s Stability and Growth Programme (SGP), which was submitted to the EC on January 14, 2010, is ambitious both in terms of magnitude and given Greeceâ€™s track record in fiscal consolidation. The plan aims for a reduction in the fiscal deficit of 10.7 percentage points of GDP over four years, from 12.7% of GDP in 2009, to 2% of GDP in 2013. This magnitude of fiscal consolidation is unprecedented in Europe and raises questions regarding the credibility of the plan – in light of Greeceâ€™s poor track record in fiscal consolidation that failed in the past due to lack of political commitment. 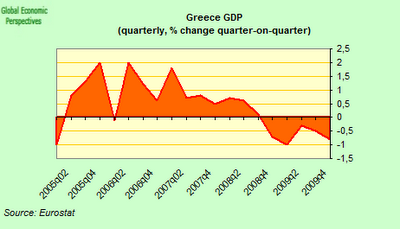 The plan also assumes a GDP growth rate well in excess of EC and IMF forecasts. According to Dan Lustig (lead analyst in Mitsubishi UFJ’s Greece team) who prepared the above chart the planâ€™s implementation will be “very challenging, given Greeceâ€™s large public sector, weak economic growth prospects and the potential for social upheaval, due to the necessity for significant public sector expenditure cuts”. 38%. The progressive character of the tax scale is basically aimed at transferring tax burdens to higher income groups, while alleviating tax burdens from low income categories. Incomes ranging from â‚¬12,000 to â‚¬16,000 are to be taxed at 18% as compared with the current 24% tax rate on incomes ranging from â‚¬12,000 to â‚¬30,000. Since around 95% of individual tax records show incomes below â‚¬30,000 this implies that low income groups should be less affected by the changes in the tax scale, although it is important to bear in mind that there is probably widespread underreporting of income. Interestingly the â‚¬12,000 tax-free income bracket includes a provision that tax payers need to submit receipts for goods and services in order to qualify. This measure has the objective of helping the tax service crosscheck data and encourages individuals to demand VAT denominated invoices for purchases. – an increase in the fuel tax rate which aims to boost revenues by â‚¬934 million in 2010. – an annual tax rate increase on real estate held by offshore firms (rising to 10% vs. the current 3%). – A Tremonti type tax amnesty whereby undeclared bank accounts deposits outside Greece can be repatriated at a 5% tax rate for 6 months after the bill is put into effect so long as the money is transferred into 1-year term deposits. – VAT will be applied to a wider category of transactions, and electronic cash registers will be obligatory in an increased number of designated activities (including gas stations, kiosk, taxis, and street markets). Such measures are expected to significantly boost VAT revenues, since many professional activities (like lawyers and doctors) were previously largely exempted from the 19% VAT system. – civil servantsâ€™ wages will be frozen in 2010, although seniority pay increases will be applied as usual. – there will be a 10% cut in civil servantsâ€™ allowances. Contrary to earlier announcements, the cut in allowances in public sector will not be proportional to the employeeâ€™s income (i.e. greater cut for high income groups and lower cut for lower income employees). According to press reports, the decision to apply a uniform 10% cut in allowances across the board was due to the legal impediments to doing it any other way. Nevertheless, the allowance cut, as well as the wage freeze measure, are the key instruments for the government effectively lowering the wage bill of the budget in 2010, in its effort to control government spending. – As a consequence, the gross monthly income of public sector employees will decline by as much as 5.5%. – The upper limit for overtime payment is reduced by 30%. – State sector pensioners will get an increase of 1.5%, in line with governmentâ€™s inflation forecast for 2010 of 1.4%. Pensioners earning more than EUR 2,000 on a monthly basis will get no increase. – There will be a hiring freeze for the public sector for 2010 (partially excluding the health, education and security sectors), and an application of the rule of 1 replacement for every 5 people who leave from 2011 onwards. Furthermore, a widespread re-allocation of civil servants will be instigated, along with the consolidation of much public enterprise, in order to increase the effectiveness of public administration. Most of the measures announced were included in the Stability & Growth Programme and are consistent with the governmentâ€™s earlier announcements. – Increase by 2 years of the effective average retirement age to 63 years of age by 2015. – Abolishing all incentives to early retirement. into the National Health System. Another excellent article, Edward, thank you. 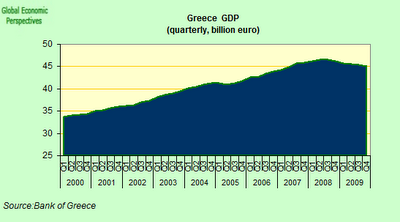 The Greek debt/GDP ratio puzzles me. It is generally reported at 113%, and this number has been basically static since a few months back. But over that same period several tings have come to light; unpaid bills, creative accounting masquerading loans as IRS’s and CCS’s, GDP revisions etc.. All of these items added together must surely send the debt/GDP ratio up by at least 10% if not more like 20%, yet everyone is still using 113% as the base for their calculations. This really does matter, because as Albert Einstein once said, “the strongest force in the universe is compound interest”. Am I completely wrong about this ? 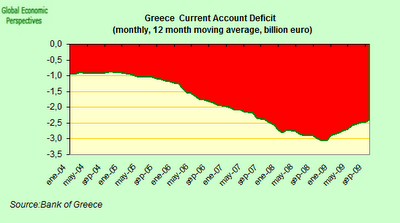 When will Greece disappear beyond the event horizon? The German Federal Constitutional Court, in its Lisbon Treaty decision (BVerfG, 2 BvE 2/08), basically says that the EU’s powers are limited and may not be used so as to substantially reduce the core sovereignty of member states. If the EU imposes far-reaching fiscal controls on Greece it seems that, at least in the eyes of the German judges, the EU has transgressed its mandate. Maybe someone should have told the German judges of Greece and the Eurozone? Not at all. I wouldn’t like to put a number on it, but the level of debt is obviously somewhat higher than so far reported. The thing is this has now become a sensitive political and financial issue. I guess the relevant authorities – the IMF, the EU Commission, the ECB etc – take the view that there is enough on everyone’s plates as things actually stand without giving more ammunition to those who want to short Greek debt. The key issue for these parties is whether or not the government has the determination to get matters under control. You can see the same sort of pragmatism from the IMF in the Hungarian context, where again all sorts of issues exist about what the true level of the 2010 deficit is likely to be. (what does “true” mean here, in any event, since all accounting is based on conventions – see the piece on EU debt and “receivables” I am about to put up). The even bigger problem is that the GDP growth projections are more like a fairy story, hence the ratio of debt to GDP will also climb more than anticipated on this front. â€œthe strongest force in the universe is compound interestâ€. As is often the case, Einstein was right. We economists call this the “debt snowball” problem. 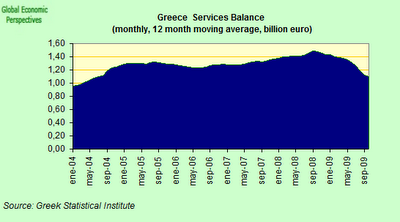 In the Greek case the ball is about to pick up momentum. The issue of whole crisis – not only in Greece, but in US,Spain, UK, Italy, Portugal, etc- is a State size too big for the real economy. For exemple in last 10 years about 57% of new jobs in UK were in State sector even with private economy overheating. If it was not overheating the imbalance would have been even more. The State size could only survive with a private sector bubble because that hiked taxes income artificially saving the State for a couple years. According to Greek newspaper articles(Kathimerini on January 21 and February 2, 2010) there is an extra “hidden” debt of at least 40 billion euros. The articles cite a report by a Committee set up by the minister of finance (Papaconstantinou) and charged with examining the reliability of the financial statistics. The report has been submitted to the Greek parliament. Enron suffered when its hidden debt became known. Greece can’t diappear but it has – with the help of GSAX apparently – destroyed its ability to service its debt and its short term relationship with the investors. It’s a trauma but how long can it last? The worst-case-scenario seems to be that the government will stop paying anything, leading to mass demonstrations, rioting, looting, lack of public safety, momentary collapse of tourism, smouldering bus stations followed by a certain period of bitter poverty for most Greeks. Would Turkey seize the opportunity and invade? I don’t think so. Tourism would probably rebound quickly as Brits jump at deals. The Greek people never learned to pay their taxes â€¦. Because no one is ever punished. For each ALBANIAN who changes HIS NAME and HIS NATIONALITY from ALBANIAN to GREEK, the Greek Government pays a monthly pension of 400 Euro for life. Most of South East Albanians are getting Greeks pensions. The total is 2 Billion Euros per year and is increasing. Now most of old couples are divorcing, because if they stay together one wonâ€™t get the monthly payment. 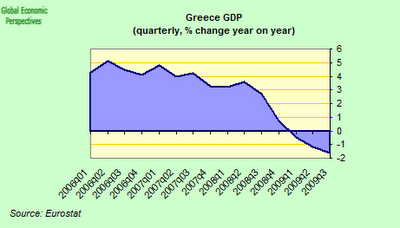 There is where Germany Grant GOES â€¦Shame on GREECE, shame on GERMANY.